The world may not await the early 1990s alt-rock revival or the resurgence of albums released as trilogies, but the Broken Machine EP suggests San Francisco-based The New Up either don’t know that, or simply don’t care. Slated as the first of three companion (if not related) short-length releases, the raspy deadpan vocals and half-jangle of Broken Machine‘s five tracks instantly evoke those post-flannel days of Doc Martens and 120 Minutes. Indeed, the knee-jerk reaction would be to write the five-piece off as some strange sort of latter-day Liz Phair / Dambuilders / Magnapop / Veruca Salt derivative, but a closer listen reveals a group that has enough of its own agenda to distinguish itself. Fronted by the blunted vocals of singer ES Pitcher, The New Up take the light flange, heavy distortion and root note as bass note philosophy that defined the alt-rock genre and rather than reinvent it, simply push it forward enough to make a familiar-sounding yet compelling batch of songs. Most notably, the flute playing by Hawk West give the songs on Broken Machine a little more character than they’d otherwise have on their own. On “Top of the Stairs,” Pitcher laments the fear of losing a love over a descending chord progression that wouldn’t sound out of place on an L7 record, but West’s ascending riff propels the song forward in direct and highly effective contrast to the guitars. On the title track, the band employs West’s instrument less for driving the melody and more for texture and atmosphere – no small feat, turning a single-note lead instrument into a background effect. 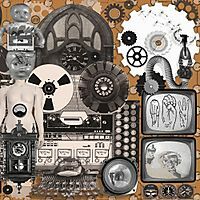 The five songs of Broken Machine run a total of 25 minutes, which in some ways works against the band but in others in its favor. While the small size makes the EP a quick and easy (and enjoyable) listen that can almost seem to be over too soon, there also exists a certain sameness to the songs where tempo and sound are concerned. Then again, the band has also stated these are but a third of their recorded works from 2008, suggesting this handful of tracks was either what the band felt were the strongest, or these five were simply the five that worked best as a group. Whatever the case, The New Up has delivered a very well-studied, well-crafted package; if what they say about trilogies is true, these five songs are really only the introduction anyway.